New Pension Scheme : Submission of FATCA/CRS declaration - PFRDA Order ** Pension Fund Regulatory and Development Authority, B-14/A, Chhatrapati Shivaji Bhawan, Qutab Institutional Area, Katwaria Sarai, New Delhi - 110016 ** File No: PFRDA/02/02/7/0001/2017-RnS-SGs ** 30th May, 2017 ** It is to noted that all NPS subscribers, including the Government Sector Subscribers Whose PRAN has been generated on or after 01 July 2014, are required to submit FATCA/CRS declaration. 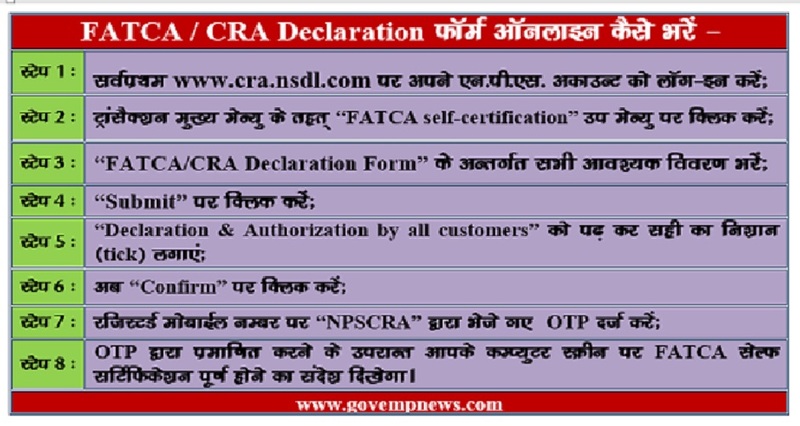 It is to noted that all NPS subscribers, including the Government Sector Subscribers Whose PRAN has been generated on or after 01 July 2014, are required to submit FATCA/CRS declaration. As per section 285BA of the Income-tax Act, 1961 read with Rule 114H of the Income-tax Rules, 1962, a subscriber to NPS is required to give a self-certification for tax residence status. Further, under an agreement signed between India and USA, details of all accounts maintained in India of the US National or the person who has tax liability to the US Government has to be reported by the Financial Institution. It is therefore required that all NPS subscribers must submit the FATCA declaration. For receiving FATCA declaration online, CRA has developed functionality Wherein the NPS subscriber can login to the CRA system as mentioned below and submit the declaration online. 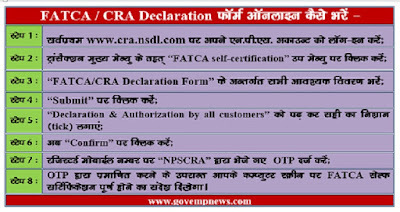 A subscriber can log in to NPS account and submit FATCA self-certification for his PRAN. Subscribers have been requested to provide FATCA self-certification online even if they have already submitted the physical Self-Certification form to CRA.